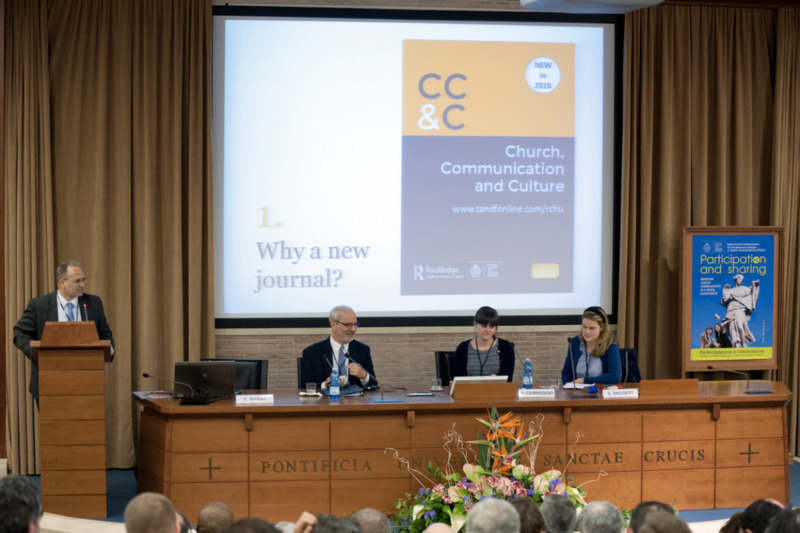 The Pontifical University of the Holy Cross established the School of Church Communications in 1996 to prepare communication professionals for ecclesial institutions. The nature of communication and the elements upon which it is based. This includes the processes of shaping public opinion, the structure of information-based entities and the language of the traditional means of communication (radio, tv, press), as well as the new technology-based media. The Church in cultural context. The Church presents its message and incarnates the faith in an ongoing dialogue with men, women and cultures. This area investigates of how Christianity has developed and expressed its message over the centuries, transforming it into a catalyst of cultural change. The theological, philosophical and canonical content of the faith and its impact on the identity of the Church as an Institution. The application of these theories, practices and communication techniques to institutions of the Church, bearing in mind their particular identity. Special emphasis is given to how communication offices are organized, methods of communicating with the various interlocutors of the Church and the presentation of the content of the faith in the field of public opinion. On Friday, April 27, 2018, the School of Church Communications celebrated the Academic feast of the Patron Saint Catherine of Siena. The program included the Prayer of the Middle Hour and a floral tribute in the Basilica of Santa Maria sopra Minerva, the guided tour of the Chapel of the Transitus of Santa Caterina, and a conference (at 10:45 am, Aula Álvaro del Portillo) by Msgr. Mariano Fazio, Vice Grand Chancellor of the University and first Dean of the School. 57% of the university students completed the quality questionnaire (“Evaluation of Courses”) concerning the subjects of the first semester of the academic year 2017-18. In total, 165 courses were evaluated: 91 of Theology, 29 of Philosophy, 26 of Communication, 14 of Canon Law and 5 of the Department of Languages. Courses that did not reach a minimum percentage of responses were not taken into consideration. The number of the filled questionnaires reaches almost 2,400. In communicating the information, Prof. Rafael Martínez, Academic Vice-Rector, thanked the students for this concrete collaboration, which represent “an important help to contribute to the improvement our teaching activity”. The questionnaire which is compiled “online” in an anonymous form, consists of ten questions in its current version to which an evaluation ranging from 1 to 5 is reserved. Il Corso si propone di fornire una specializzazione teorica e pratica al fine di sfruttare al meglio la comunicazione online e l’identità digitale nei social più importanti: Facebook, Twitter, Instagram, Youtube, Google, tra gli altri. È rivolto ai responsabili Comunicazione di organizzazioni non profit nell’intento di offrire loro le conoscenze e le risorse per gestire le reti sociali personali e istituzionali, e di approfondire le relative dinamiche e gli strumenti di analisi. Seminario per professori, il 26 febbraio, sugli "Effetti collaterali della post-verità"